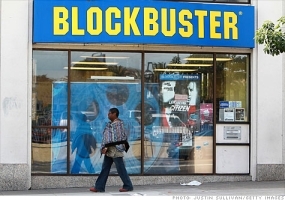 Blockbuster Is Bleeding; Will It Live? Blockbuster Video is a company in transition. Like the music industry, it cannot find a way to balance its crushing debt loads with its revenues after over-expansion, some very stupid business decisions, and a general market shift away from the core of its business. Blockbuster is nearly a BILLION dollars in debt! The company is finally making some bold moves in an attempt to stay alive, but are they too little, too late? Long story short, maybe they are. Blockbuster signed a deal with T-Mobile to be the first official movie provider for cell phone. Blockbuster Video will be an app on the HTC HD2 phone. The company has also used its muscle to negotiate a first-in deal with Warner Brothers, shutting out more profitable competitors Netflix and Redbox. They’ve rolled out their own Netflix-style service with video on demand AND their own Redbox-style kiosks. They’re also closing locations left and right (my town is littered with closed video stores). Still, the demographic shift away from physically driving to the video store and wandering around is hurting them, badly. It’s also hurting competitor Hollywood Video/Movie Gallery, too. The company is being forced to sacrifice future profits for cash up front in an attempt to avoid being eaten by Comcast.